No Bengali kitchen is complete without a bottle of Jharna Ghee. I was sharing with S, anecdotes of my encounter with this favourite brand of ghee (clarified butter) that adorns my kitchen and comes of use when you want to make an aromatic and creamy mashed vegetable. One of my summer favourites is to boil potato, parwal, pumpkin, mash it and add finely chopped green chillies and a dash of salt. Drizzle ghee and have it with hot piping rice. Another way of relishing Jharna Ghee is to enjoy it with Gobindobhog Rice (a variety of short grained and aromatic rice found in Bengal) with mashed potatoes and a boiled egg. 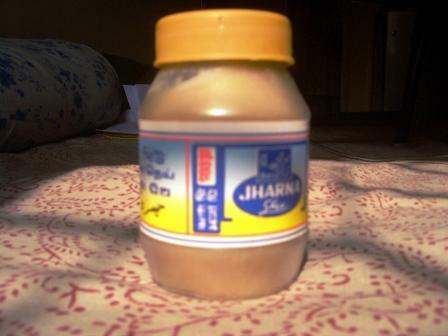 Jharna Ghee continues to be my comfort food till date.